As a seafaring nation, England was at the height of its empire through much of the eighteenth and nineteenth centuries. With far-flung colonies, a mighty navy, and one of the the world’s largest merchant fleets, the British were a dominant force in global trade for the better part of two centuries. 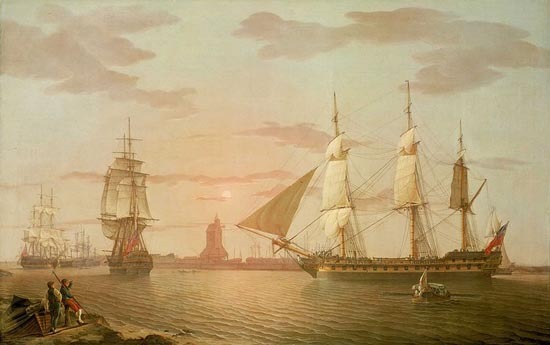 British merchant ships like the British East Indiaman “Warley” (above) made voyages to India, China, and other destinations throughout the British Empire in the late eighteenth and early nineteenth centuries. Photo via wikipedia.org.uk. Much of their trade was in goods from the colonies, that in turn created a strong demand for finished products exported from the British Isles. Outbound merchantmen carried cargos of all descriptions, including casks of stout and ale. A full load of cargo aboard a British merchant ship. Photo via joyfulheart.com. The well-known India Pale Ale, or IPA, originated as a result of this global trade. IPAs were brewed by the British. They were strong and heavily hopped, so as to survive the long ocean voyage to India. Stouts, brewed by both the British and the Irish, likewise were specially brewed strong for the export market. These export or “foreign” stouts had a much wider distribution than IPA and were tailored for specific geographic regions and climates. Every producer had their own versions, which reflected the intertwined development of stouts and porters of the day. Traditionally, British and Irish stouts had some characteristic differences brought about by their base ingredients, brewing traditions, etc., but the export versions of both were similar. IPAs depended on a very high hop rate throughout, as well as dry hopping, for preservation. Export stout could be highly hopped, but the brewers relied on high alcohol content, and to some degree, a secondary fermentation in the cask or bottle rather than dry hopping to insure that their product survived the long voyages. ABVs were in the six to nine percent (or sometimes higher) range depending on the market. 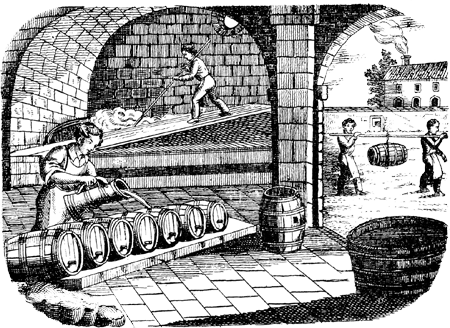 A nineteenth-century brewery. Photo via Wikipedia.org. While Russian Imperial Stout was a mainstay of British export to the Baltic region, and London export stouts and porters found their way around the world, the story of Irish export stout is pretty much the story of Guinness. Guinness began brewing in Dublin upon acquiring the St. James Gate brewery in 1759. Their initial products were porters and ales for the local market. They were exporting to London by the early 1800s, the West Indies and throughout the empire by 1820, and New York and beyond by 1840. During this era it was common practice for the Irish brewers to sell their products in bulk to British exporters who would then bottle it for shipment. England became not only the export agent for Guinness, but its largest consumer as well, outselling the London porters and stouts in their home market. The Guinness “Double Extra” was the world’s favorite export stout and survives to this day. By the 1880s, Guinness had become the largest brewer in the world and was exporting to the entire British empire, Europe, the Americas, Asia, and beyond. The global reach of the British merchant fleet along with a worldwide expat population made this possible. As time went on, the various countries established their own breweries, mostly for economic reasons, and Guinness licensed production abroad. 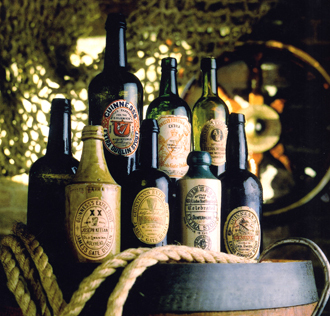 The versions of stout produced in these offshore breweries reflected the export products that had been originally shipped from Dublin. Today, the Double Extra Stout remains popular in the Caribbean region as a classic example of Irish export stout. 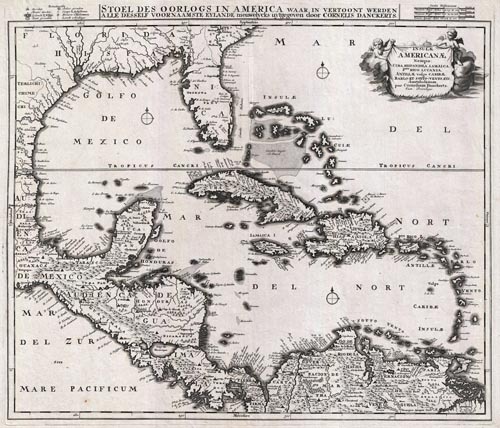 Shipments of Guinness export stouts to the West Indies and the Caribbean contributed to the establishment of breweries in the region, where stouts remain popular today. Image via Wikipedia. In modern times, tastes have changed and most consumers equate stouts with contemporary draft Guinness, which has nothing in common, except color and name, with the original products. Fortunately, the craft breweries of both the U.K. and America have revived this once hugely popular beer style and have looked back to the original recipes for inspiration. While there are numerous interpretations of export stout today, there were also just as many as there were brewers back when. Style guidelines put forth by the Brewer’s Association (BA) and the Beer Judge Certification Program (BJCP) describe it in the broader category of “Foreign Extra Stout” which includes both the British and Irish varieties among many others. To call this a broad category is an understatement, but the common theme is that these beers came about simply as a much stronger version of the original domestic product, were very dark in color, contained bittering hops only with no aromatics, were not dry hopped, and could have either a dry finish for the Irish version or a malty or sweet finish for the British version. 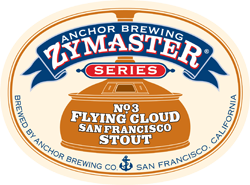 For the third offering in Anchor Brewing Company’s Zymaster series of specialty brews, our Brewmaster Mark Carpenter re-created this classic style. We named it Flying Cloud San Francisco Stout after the famous 19th century clipper ship that set the world record for the shortest sailing time between New York and San Francisco in 1851. The Flying Cloud broke that record in 1854 and held it until 1989. Now available as part of our Argonaut Collection, Mark’s export stout is somewhat of the Irish style and contains 7.4% ABV. The recipe consists of Maris Otter pale malt, two black malts, flaked barley, and Golding hops, much the same as the stouts of 200 years ago. 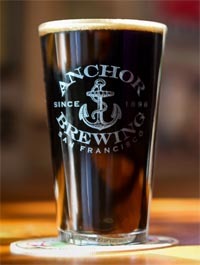 We hope you have the opportunity to enjoy a pint of Flying Cloud San Francisco Stout, and join us in raising an Anchor to the hundreds of years of brewing tradition that gave us this rich, dark, flavorful brew. Great little read! Cheers! Love the beers you put out. Always smooth, tasty and consistent. Would I be able to find flying cloud bottled anywhere? I live in Tucson, AZ.